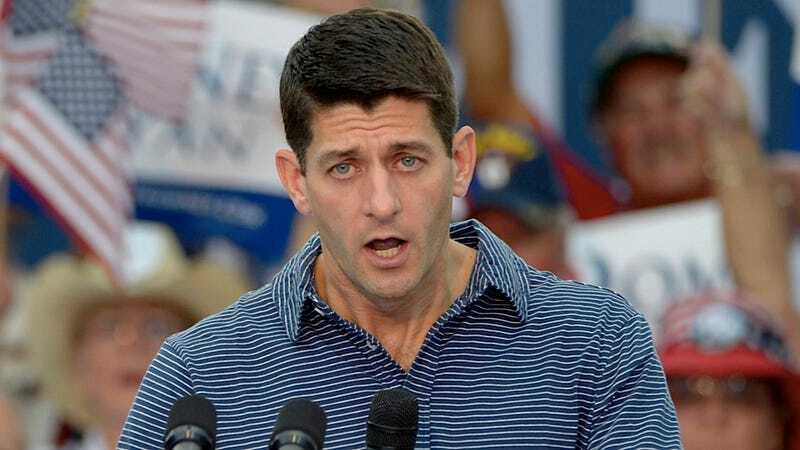 As part of his ongoing effort to make sure that as few women vote for Mitt Romney as possible, Paul Ryan told the fine people of Orlando who'd spoiled their Saturdays by listening to Paul Ryan brag about how many times he'd ridden Tower of Terror that he would remove the Affordable Care Act's "contraception mandate", which requires even Catholic hospitals and universities to offer contraception, on "day one" of a Romney presidency. Paul Ryan would remove this mandate while doing one-armed military presses with the trunk of an oak tree and winning the Tour de France. "It will be gone," Ryan, with the confidence only a used car salesmen on his fifth nip of Wild Turkey can muster, said of the mandate. "I can guarantee you that." According to the Huffington Post, Ryan has previously criticized requiring that Catholic universities and hospitals — which employ a whole Carnival cruise ship of non-Catholics — offer contraception as a "violation of our First Amendment right of religious freedom." Ryan was answering an audience question about how he would debate fellow Catholic, Vice President of Backsassin' Joe Biden, who, rumor (my rumor) has it, privately asked that instead of a debate, he and Ryan just get into a bar fight. At some other point during the sordid Saturday spectacle in Orlando, Ryan tenderly cupped two sacks of tangerines and derided the Obama administration's handling of the space program because no astronauts have been to Mars yet and Paul Ryan has already been there like fifteen times or whatever in his private space capsule and doesn't see any reason for the big delay.